I’m not sure Hello Neighbor is even a game. I think it’s a YouTube situation that got out of control. Once an ‘early release’ on PC, YouTubers across the world beamed this nonsense into the brains of children. There is a point to the premise of breaking into a man’s home, to see what he’s hiding in the basement. It could be riches, it could be slabs of chocolate long since removed from sale. It might even be dead bodies, which is likely given the screams we hear, and it’s up to you to find out. You play a strange, ugly child who seemingly has too much time on his hands. Opposing a man who is clearly up to no good, but never actually goes much further than setting back your progress slightly. The opening cinematic sees this ugly child kicking a ball, which rolls into the yard of the ‘neighbour’ and as he attempts to collect it, casually views the old man locking his basement with a large gold key. This is the premise and why the boy suddenly decides that he must discover what the man is hiding. So, with a weak concept established the game dumps you in front of the old man’s house and tells you nothing. It hints that there are some controls – a button to pick things up and another to throw whatever you’re holding. There’s a sprint button as well, because you’ll need to run away from the creepy old dude. If he so much as glances in your direction his focus sharpens with laser precision to chase you, corner you and carry you back to the front of his house. It doesn’t matter if you’re just standing on the porch or breaking in through his bedroom window, the outcome is always the same. The screen vibrates horribly and suddenly the neighbour is there, arms outstretched. Occasionally the game throws a curveball and depicts you in an odd nightmare world, instead of just a step further than the driveway. In these sections the world is dark, the neighbour is often larger than life literally and figuratively. Again, the game tells you nothing. There is no objective that flashes onto the screen, no arrows that tell you that it might be an idea to pick up boxes and stack them. You could postulate that Hello Neighbor is a sandbox game that allows you to experiment with items and outcomes. Except it isn’t. You can open every drawer or cupboard and find nothing. Everything is empty, lifeless and meaningless. Go into some of the other houses and look in the fridge or under the stairs. It’s an apocalyptic wasteland of silence. Tap the record player, it plays a tune. Distract the neighbour by shutting off the electricity to his house, do whatever you like, but he’ll probably catch you anyway. Hide in a wardrobe while he runs at you and he’ll look aimlessly about, but still open the doors to grab you and bundle you back out. There’s no stopping him, he’s like a Terminator. If you do manage to outwit the neighbour, you’ll find yourself dashing around like a chicken with its head cut off. Seemingly endless mazes of corridors and bland rooms await you as you scurry around looking for a plot device. Darkness seems to surround you from the second act onwards and it sets up a sense of fear by forcing you into panicked situations. After the first few times getting caught, the game just becomes repetitive. You can throw objects to halt the neighbour for a short period of time or try to lose him through countless doors, but there’s no gravitas to the situation. The game became famous for YouTubers scaring themselves so that the audience can laugh along nervously. It works more as a visual stimulus than an interactive one. Because the world is so empty and devoid of anything particularly interesting, the scares fall flat. There needs to be an intermediary; in the first instance a YouTuber or failing that a cohesive and exciting plot. It’s hard to tell whether the game is pitched at adults or children, so I let my kids have a go. They’ve watched the videos, I thought they’d appreciate it more than me. They picked up boxes, made makeshift columns to reach heights. They threw tin cans through windows and waited for the neighbour to catch them. Initial squeals soon died down as they realised there was no real atmosphere to be had. That’s where the YouTube families and celebrities came in. Without them, they just didn’t care. It doesn’t help that the physics are ridiculously wobbly, and everything looks as if it has been dragged kicking and screaming from the early days of the GameCube. 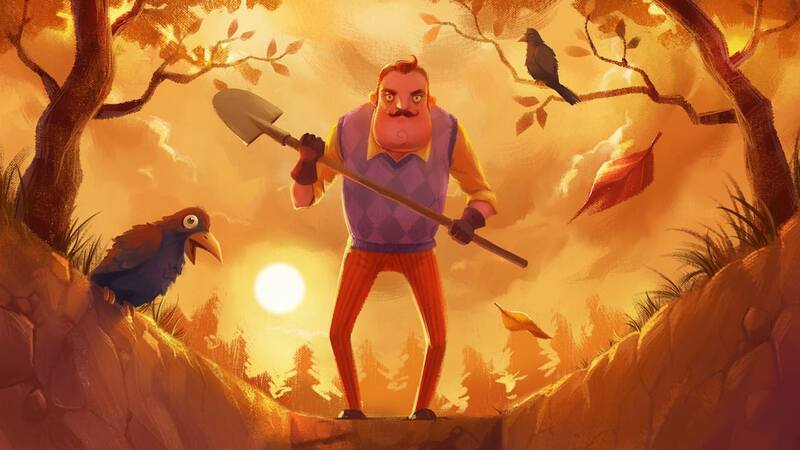 Hello Neighbor could be fun, within the right parameters. The neighbour would hold a lot more terror if his actions carried any weight. The puzzling aspect of switches, hidden doors and traps would be more enjoyable were they staged within an inspiring world or using interesting concepts. But the game fails on all of these points, not holding attention, not really projecting any fear beyond the first few encounters, and the world feels as flat as the polygons used to build it.